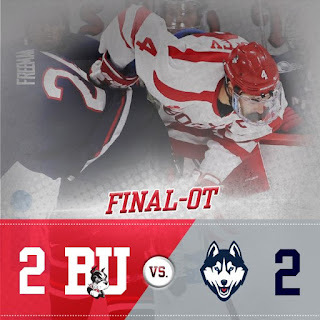 #7/8 BU settled for a 2-2 tie with Connecticut in the first game of a home-and-home series. The Terriers held 1-0 and 2-1 leads, thanks to a pair of Bobo Carpenter shorthanded goals, but UConn matched each one with a power play goal. BU dominated the first period, outshooting the visitors, 14-7, but couldn't put a shot past the Huskies’ Adam Huska. The Terriers took their first lead while killing a penalty midway through the second when Carpenter raced past a defender and beat Huska with a backhander to the glove side. But 20 seconds before the man-advantage expired, Johnny Austin’s center point blast glanced off Jake Oettinger’s glove to tie the score. The Terriers regained the lead late in the period, again while on the penalty kill, when Huska misplayed Jordan Greenway’s clearing pass near the right circle. Carpenter gained control, went around the cage and backhanded a sharp-angle shot for a 2-1 lead at the end of two periods. Shots were more even in the second with BU holding a 14-12 advantage. The Huskies went back on the power play at 5:37 of the third. With seven ticks left on the man-advantage, Alexander Payusov—unmarked near the crease—flipped home a rebound after Oettinger stopped the initial shot by Max Letunov, knotting the score at 2-2. With UConn holding an 11-5 shot advantage in the third, neither team could break the tie and there were only a few shots on goal in the scoreless overtime. The teams conclude the two-game series this afternoon at the XL Center in Hartford with puck drop set for 5 p.m. The game can be heard on Terrier Sports RadioNetwork and there’s a pay-per-view live stream on Husky Vision . 2018 recruit Joel Farabee had a hand in all three NTDP U18 goals in a 3-0 shutout of Dartmouth. The speedy wing from Cicero, NY scored a short-handed goal and assisted on two others, while fellow recruit Jack DeBoer produced a pair of assists for his second consecutive two-point game. Farabee, who led the U17s in scoring last season, has a 7-5-12 line in nine games. Terriers dropped a 4-2 decision to Maine at Alfond Arena on Friday. The Black Bears took a 2-0 lead after one and added a third goal at 7:35 of the second period. Just a minute later, freshman Nara Elia’s wrist shot got the Terriers on the board. Senior Victoria Bach brought BU within one, roofing a backhander at 7:18 of the third. BU pressed for an equalizer but a Maine empty-netter closed out the scoring.